One morning before the sun, the settlers of Willimantic were jarred awake by the scream of Indians at night. Fearing for the safety of their wives, children and town, the menfolk leapt from their beds and ran into the night air, guns in hand and nightshirts flowing behind them. It was a fierce battle, but the screams were silenced. The next morning, the first light revealed thousands of dead bullfrogs, hearts pierced at the height of their mating season as they crooned for their mates. Yes. They shot the frogs. 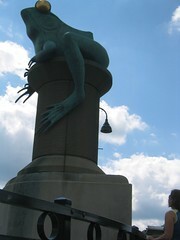 Instead of cowering with embarrassment, the townspeople embraced their ridiculousness and deemed the frog to be the town mascot and erected frogs upon giant spools (a nod to the textile heritage of the town). A frog festival is held annually and frog art is displayed liberally. Willimantic, we salute you. Ribbit.